Struggling to shed weight and keep it off? We’ve polled seven dietitians for the single most important weight loss tip they share with patients. May their tips offer you inspiration. Tip 1: Don’t let hunger deter you from sticking with your diet. Whatever diet you choose — and many different diets can help you lose weight — don’t give up because you get too hungry. When you have diabetes, a diet with fewer carbs (like bread, pasta, rice, desserts, sugary beverages, juice) is also important because you’ll need less insulin. And that can help prevent hunger, fat storage and weight gain. Replace processed carbs like white bread, bagels, muffins or donuts for breakfast with high-protein foods like eggs, or Greek yogurt mixed with chia seeds and berries. You’ll find that you stay fuller, longer. Tip 2: Don’t eat a carbohydrate unless it has fiber attached to it. Fiber helps improve blood sugar control, helps lower cholesterol, and reduces your risk of chronic diseases like diabetes, colorectal cancer and heart disease. Foods rich in fiber include legumes (dried beans, lentils), veggies (Brussels sprouts, broccoli, spinach squash, sweet potatoes) and fruit (apples, berries, oranges, pears). Tip 3: Focus on healthy behaviors, not the number on the scale. Replace a goal like “lose 2 pounds a week” with specific mini-goals, like “eat 1 cup of veggies at dinner,” “walk 20 minutes a day,” or “keep a daily food log.” If you’re disappointed with your weight progress at week’s end, reflect on how well you stuck to each goal. Try tracking lifestyle changes, food, exercise and weight in a journal. At the end of each week, check off which new habits are going well and which need more work. “Your health is a lifelong journey,” she says. Tip 4: Make plants the foundation of your diet. Different weight loss approaches work for different people. But plant foods should be the foundation of any diet. That means enjoying lots of non-starchy vegetables like broccoli, cauliflower, kale, cucumbers and bok choy, and fruits like berries, apples and pears. Plant-based foods contain a variety of vitamins, minerals and phytonutrients that help support your cells and reduce inflammation, she says. They also provide fiber and water, both of which help you feel fuller. Tip 5: No foods are 100 percent off-limits. When you label foods as “good” and “bad,” you naturally fixate on foods you shouldn’t eat but typically still crave —and likely will crave more when they’re totally off limits. When working with children, she teaches them which choices are better and will fuel their bodies more effectively, rather than giving them lists of foods to eat and foods to completely avoid. Feelings of guilt from eating forbidden foods can snowball into unhealthy emotions in childhood, adolescence and even adulthood, she says. Tip 6: Spend your calories wisely. All calories are not created equal. “If your diet consists mainly of sugar, saturated/trans fats and salt — all of which can be very addictive — you can develop consistent cravings for dense, high-calorie foods with little nutritional value,” says Julia Zumpano, RD, LD. Eat foods that are high in lean protein, healthy fats and fiber, and you’ll feel satisfied throughout the day and will rarely get cravings. This will help you maintain a lower calorie level, which will lead to weight loss. Tip 7: Plan tomorrow’s meals today. 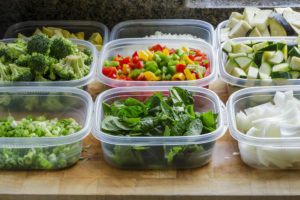 Planning ahead stops that “grab what you see” panic that sets in when you wait to plan dinner until you’re starving at 6 p.m. Scaring up dinner on the fly is likely to bring less nutritious, higher-calorie choices to your table. When you sit down for dinner tonight, plan what you’ll eat for dinner tomorrow. “It’s so much easier to do when you’re not hungry,” says Andrea Dunn, RD, LD, CDE. “This also gives you time to take something out of the freezer, chop veggies tonight to put in the crockpot tomorrow morning, and ask which family members will be home for dinner.